Now privately owned and preserved, this little ship has had a very interesting history. ST JUST was built in 1952 by R J Prior and Sons at Burnham-on-Crouch, a yard which is still in existence today. Originally named LALLA ROOKH II, she was built as a research vessel for the Kelvin Hughes company. In 1962 she was sold to other owners, believed to have been in the Falmouth area, and she was renamed ST JUST. New employment as a small charter boat eventually led to her appearing in Scottish waters a few years later, mainly working out of Oban. In 1985, she embarked on a new career - she became a drugs running boat, bringing a cargo of cannabis back to Scotland from West Africa. Followed by one of HM Customs Cutters as she sailed north from Land's End towards Oban, she was impounded in the largest drugs haul of the day, and taken eventually to Greenock, and sold at auction. 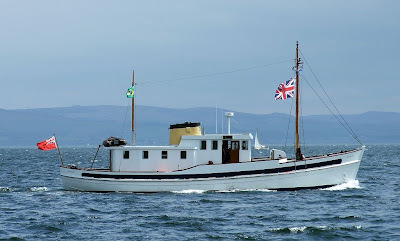 Her new owner was from the Oban area, and he renamed her FALLS OF LORA, and she became a charter boat once more. From 1990, she lay in the Gareloch, until sold for preservation in 1999. She took the name ST JUST again in 2003, and since 2007 she has been listed on the National Register of Historic Ships. ST JUST is now based at the River Clyde Boatyard at Clydebank.